Investors Underground is one of the most popular chat rooms about trading. Owned by Nathan Michaud, they have been around for some time now – since 2008. You might have already heard of many traders that use their services, like Tim Grittani and Eric Wood. However, now we will present you with a thorough Investors Underground Review so that you could assess their services yourself. Mainly used as a chat room, Investors Underground also offers day trading courses. One of them is the Textbook Trading meant for beginners. In addition, there is also Tandem Trader course for advanced users who want to know more about different strategies. 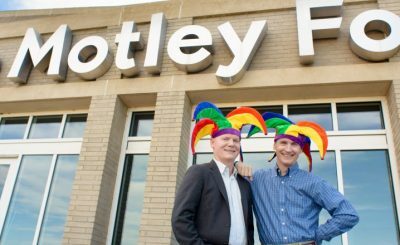 Investors Underground was a part of the profit.ly platform, but they left it in 2015. However, it is still one of the biggest online trading communities where traders can share opinions and learn from other users. 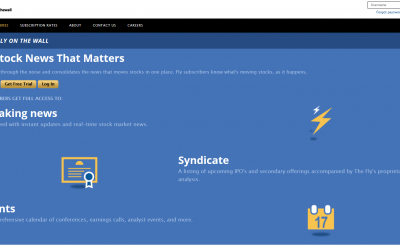 The founder of Investors Underground is widely known by his Twitter username – @InvestorsLive. He posts daily market updates, as well as his own calls. The idea came to him in 2004. With only one year of experience in day trading, he created InvestorsLive.com, a predecessor of IU. He also holds a degree in finance which he attained in 2007. Nathan Michaud is a well-known trader because he usually has a fantastic feel for the markets. Twitter is his social media of choice, and users generally follow him because he offers various insights into stocks trading. Moreover, he often makes both long and short trades, which makes him a rather versatile trader in his own right. While doing research for this Investors Underground Review, we carefully considered all trading styles users can choose to follow on this platform. First, there is the Momentum Trading chat room, which most traders tend to focus on. However, there are also two more chat rooms: OTC trading and Swing trading. 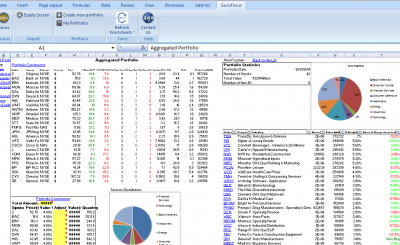 Momentum trading means that users find stocks that have an above average trading volume. In addition, the stocks should also have an exceptional level of volatility as well. However, do not confuse this trading style with scalping. Most of these trades are held for just a couple of hours. As far as the analysis goes, most of the trades rely on technical analysis. Both the founder and other prominent traders focus on setups that are low risk, yet with greater reward potential. Some of the tools they use for these setups are ABCD charts, which aren’t that different from the ascending triangle. Moreover, they also use short selling moves, red or green reversals, etc. However, the main tool they use for successful trading is VWAP. This is an indicator that shows the volume-weighted average price. Although it might seem a bit chaotic at first, you can learn a lot at Investors Underground. It is one of the most diverse services out there. 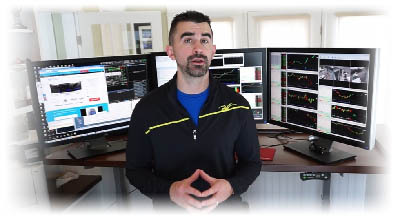 Nathan Michaud and his fellow traders are constantly working on different setups and stocks. Some days they will trade $1 stocks, while others are reserved for more expensive ones. In addition, they are not afraid to go long or short – both types of trade are quite frequent. While it may be a bit too much for a beginner, if you persevere, you could have lots of use out of this service. When comparing trading styles for our Investors Underground Review, we have found that they usually define which chat room you will pick. However, most of the activity is in the Momentum Chat Room, although you can learn a lot in Swing and OTC as well. This chat room is one of the most popular ones, and most traders are there to learn more about different stocks. However, they have strict rules when it comes to general posting and usage. It may seem a bit different at first, but once you spend more time on it, you can appreciate the reasons behind these rules. Firstly, you cannot just start a conversation about anything. 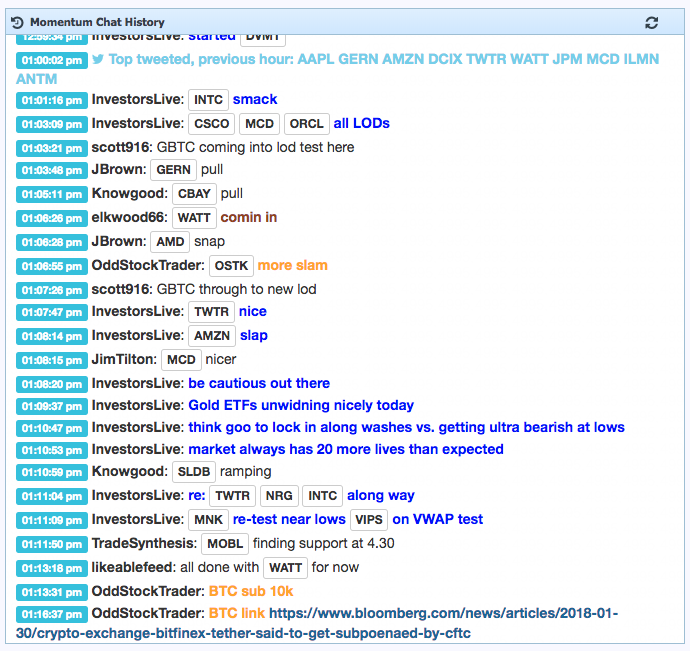 Because IU chat rooms are for serious traders, there is no room for meaningless chatter. Usually, other services offer a bit more space for casual conversation. But, IU will mute any post that doesn’t add value to the timeline. Even if this isn’t something you are looking for, it is worth trying out. The main idea behind it is to remove the distractions and only have posts that are beneficial for users. Secondly, there are far more traders in Investors Underground that offer alerts and insights. While other trading services usually concentrate on one single trader, IU stays away from that approach. There, you can get alerts from well-known moderators and traders such as Tim Grittani, AT09, TexMex, and others. You may not share the same trading style, but it is still valuable to know what they think about certain stocks. Thirdly, it is vital to learn the lingo and jargon they use in this chat room. Other similar services usually post alerts that are simple to follow. However, Investors Underground is more about ideas and general comments about certain trades. In addition, it is important to use fast-paced language so that other users can easily follow new posts. If you are someone who doesn’t know a lot about technical analysis, then the Swing Trading Chat Room is the best option for you. The woman behind it is Michele Koenig, and she also runs her own service called Tradeonthefly. Inside this chat room, you can see her annotated charts, as well as other trade ideas she shares every day. In addition, this chat room is also fantastic for traders who don’t have the time or just cannot monitor the market all day. The activity inside this chat room varies. If the OTC market is currently active, there will be many traders online sharing their insights. When there is some activity involved, there are many key moderators who share their comments. 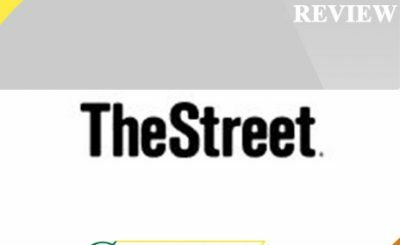 Some of them are bbstock, OddStockTrader, and oilgusher. They will also give valuable insights about OTC markets, which in turn will help you stay safe while trading. Furthermore, if you are interested in penny stocks, these traders offer precious observations about that as well. Just like we said above, you might have a tough couple of days once you sign up for this service. It can be difficult to track the alerts and ideas many traders give every day. Because of that, it is a good idea to concentrate on the video lessons first. 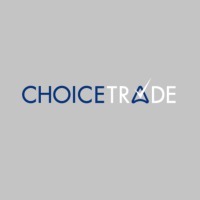 They will help you get a better idea about some of the trade alerts. There are hundreds of these lessons in the library, and the founder, Nathan Michaud, also films weekly new trade recaps. These can especially help you if you are new to the trade market because Nathan explains in details why he used a particular style when trading certain stocks. 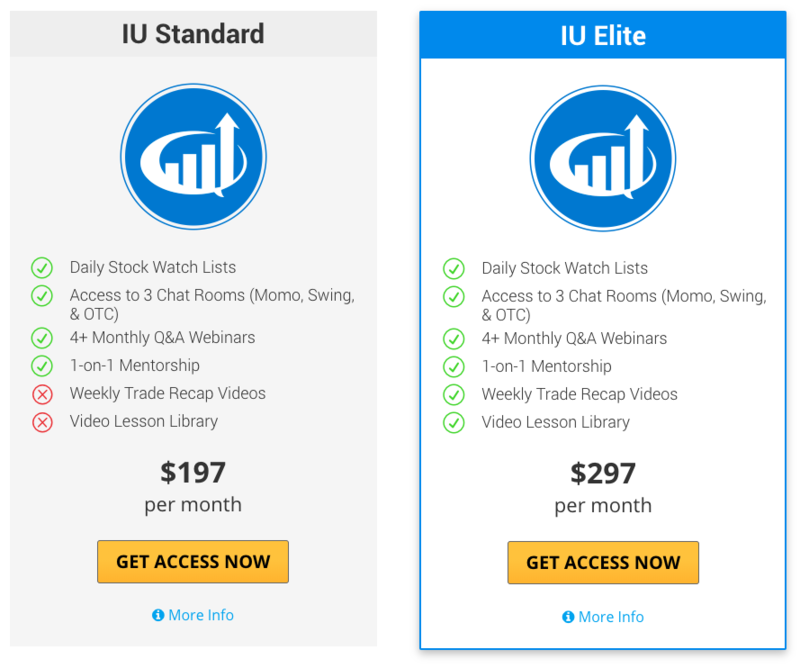 Once we delved further into our Investors Underground Review, we have found that IU also offers webinars. There are a few of them each month, and they are exclusive to members only. However, if you are a member, you can get insights from traders like Emil, AT09, and Nathan Michaud himself. 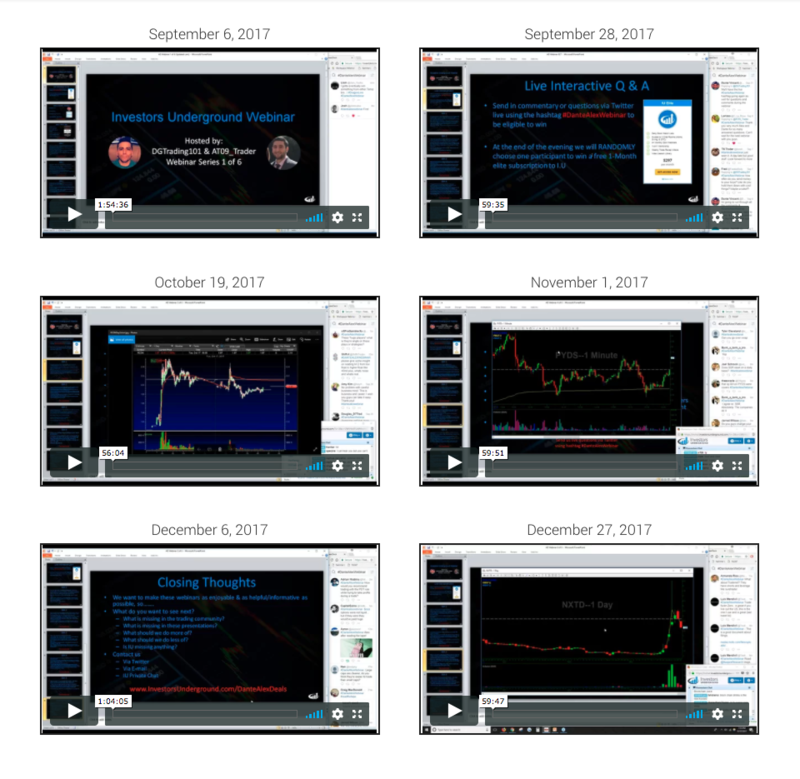 Before, he was the only one making these webinars, but nowadays, some moderators are also doing them. Moreover, they have different trading styles, so you will certainly learn a lot more from them. Investors Underground lets you choose between two subscriptions. The first one, Standard, will cost you $197 per month, while the other one, Elite, $297 per month. Although the prices are steep, we have found them to be accurate and worth the splurge. 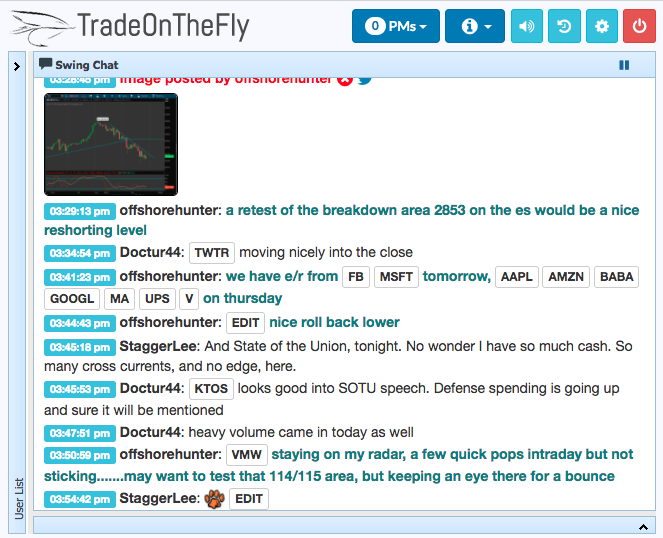 Rarely can you find chat rooms like these that offer so many insights into active trading. And, IU community is one of the main reasons we believe their services are worth the money. In addition, you will also get to share ideas with other well-known traders, and see many useful alerts. 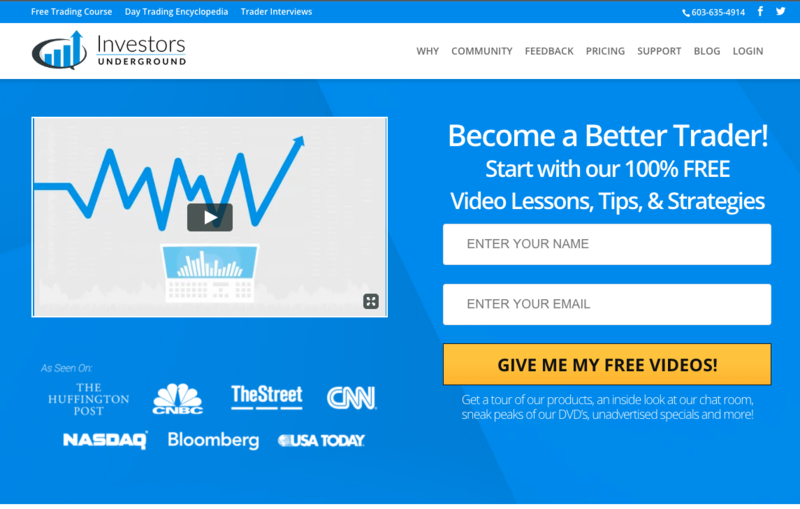 Moreover, there are video lessons that can help you learn more about trading and markets in general. Choose Elite. You will get access to video lessons, and to weekly recaps as well. In addition, there is a library of hundreds of other lessons which you can use for further trading research. Choose a quarterly subscription or a bundle. IU often has deals for their services – you just have to find them. If you are a trader that already has some market knowledge and how it all works, then IU might be the best place for you. The chat rooms are active and useful, so you will have an opportunity to learn every day. In addition, they also offer a lot of valuable alerts that will guide you in the right trading direction. However, if you are someone who just started learning about trading, then you will probably get confused. The chat rooms are not for the faint-hearted because of the lingo and the often used jargon. Therefore, it might be best to go through their free trading course first, and then advance to their other services. With that in mind, do not think that this is a service where you can just emulate the alerts. You have to dedicate yourself to learning about the market every day. Furthermore, if you are someone who can actively monitor the markets during peak hours, then you will have a lot of use out of Investors Underground. Is Capital One Investing the Right Fit For You?